Hiking through The Great Smoky Mountains is a magical experience as you are enveloped by the sights and sounds of nature. 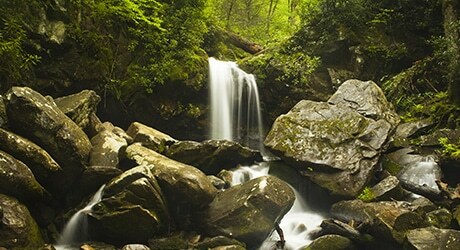 When planning your hiking adventure make sure to visit some or all the waterfalls in the park. Hiking to the waterfalls is ideal on a hot sunny day, as the shade from the trees is perfect for keeping you cool. As you make your way to the falls you’re encompassed by the breathtaking geological formations. You will absolutely want to bring your camera and grab a snapshot behind the falls. Enjoy a light spritz of the refreshing mountain springs during your hike. 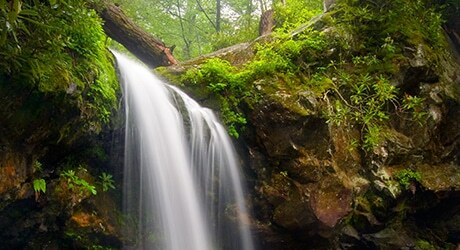 Whether it’s spring, summer or fall a waterfall hike will be great for all.